It is early December and Solstice Lake is already frozen. Light, airy, ethereal snow sleeps upon ice. Light, airy, ethereal snow sleeps upon branches of trees that scatter themselves across Solstice Mountain. Heavy clouds hover pregnant across the sky with no beginning, no ending. Into this world, so soon, a baby will be born. In less than one month, I will carry this cooing baby down a snowed-in hillside to a home with smoke twisting from the chimney. This cooing baby, I imagine, must love the cold, whipping wind because this cooing baby was created from the cold, whipping wind on Solstice Lake, beside Solstice Mountain. I cradle this cooing baby against my chest, skin to skin. Outside the home with smoke snaking from the chimney, winter coils around trees and dances across Solstice Lake. Plumes of snow, plumes of smoke create a funnel from home to the heavens. I read this cooing baby poems to soothe. On this day, I choose the poems of Cold Mountain—that lunatic, ancient Chinese poet who lived in a cave on Cold Mountain and wrote his poems on rocks, on cliffs. He can show this cooing baby and me how to live here on Solstice Lake, beside Solstice Mountain, in the home with smoke spiraling from the chimney. His words might illuminate to both this cooing baby and me how to turn place into home, how to weave ourselves within lake and mountain. When this cooing baby cries, I read Cold Mountain aloud: What’s this crying for / those tears as big as pearls. When this baby cries for Mother—Her beauty transcends the immortals—I read Cold Mountain aloud: a voice of a voice echoing through home. I was not born on Solstice Lake. Nor was the baby’s mother born here. I was born beside mountains older even than the rock outcropping Cold Mountain. And though it took me a half a lifetime, I found these new mountains as quickly as I could. So did beautiful Mother. Now we plan to never leave. Cold Mountain, he didn’t get to Cold Mountain till he was thirty. Beautiful Mother and I were slower. But, now that we are here, we vow to make Solstice Lake our heart. 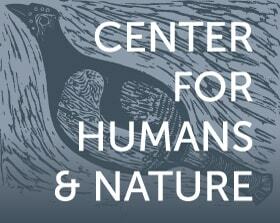 Solstice Mountain will be our shoulders: Towering cliffs where the home I chose bird trails beyond human tracks. Home. If you are looking for a refuge / Cold Mountain will keep you safe. Safe. Home. Home. Solstice Lake—Wild geese and swans / flying up in the clouds. Home. Solstice Mountain—People ask the way to Cold Mountain / But roads don’t reach Cold Mountain. Home. This cooing baby: Our baby gurgles and coos. One mind: My true home is Cold Mountain / perched among the cliffs beyond the reach of trouble. Here, on Solstice Lake, we sculpt land not into the shape of ourselves, for we are fleeting, but into the shape of Solstice Lake, into the shape of ten thousand things, so that our land mirrors Firs, Birches, Maples, and rock ledges upon our summer lake—a spectacular re-imaging upon water. It is as Cold Mountain writes: We should attire ourselves from the land—with bark hat and wooden clogs and with hemp robe and pigweed staff. So beautiful Mother, this cooing baby, and I wear gloves of garden compost, our lips painted red from Raspberries, tongues sticky from honey, eyelashes glistening with cold-smoke snow. Just like Cold Mountain, let us write our lives in poems on Birch bark and onto moss-covered rocks. No matter how permanently we build the home with the smoke corkscrewing from the chimney, Cold Mountain prophesizes, in some distant future of tomorrows, that its sides have caved in / its walls are cracked / its beams are askew / its tiles lie shattered / its decay won’t stop. By then, this cooing child, beautiful Mother, and this father who reads Cold Mountain are little less than bones swallowed into earth. Little more than blooming at dawn gone by dusk. Cold Mountain tells us of death: Once they are buried beneath the weeds / the morning sun is dim / their flesh and bones disappear. Our cooing baby’s bones, too. Cold Mountain sings a song and this verse tells us that births and deaths never cease. Cold Mountain sings another verse: Death remains impartial. I lullaby Cold Mountain to this crying child: both life and death are fine. Our descendants, if they look into the spiral swirl of time, will see nothing, will see only a dance of white within a world of gray, will see a lake alone and a mountain—older, wearier, but still protecting us all. All of us. Cold Mountain shows this child, Cold Mountain shows me, that the seasonal round never stops / one year ends and another begins / ten thousand things come and go. Cold Mountain shows us that we are all refugees until we are home, until we become home, until we defend home as we defend family. Cold Mountain is a mountain; Cold Mountain is a man. Those are one and the same. Or else it’s the lesson that Cold Mountain never wrote down that teaches us how to live this one life, how to walk away from this life, how to move into the realm of the ancestors. Cold Mountain, when it was time, simply walked into a crevice on Cold Mountain, and he disappeared home. Cold Mountain became Cold Mountain. Maybe Cold Mountain sang this song as he entered his final home: My home / it’s called the darkest wild. Author’s note: Italicized sections are Cold Mountain poems from The Collected Songs of Cold Mountain by Red Pine, Copper Canyon Press. 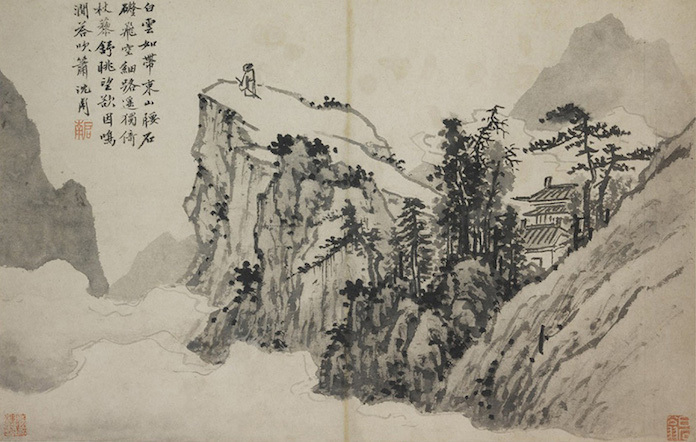 "Poet on a Mountaintop" by Shen Zhou (沈周, 1427-1509), Ming Dynasty (1368-1644).